As you may already know, FogBugz offers an impressive array of search axes to help you slice and dice your data. 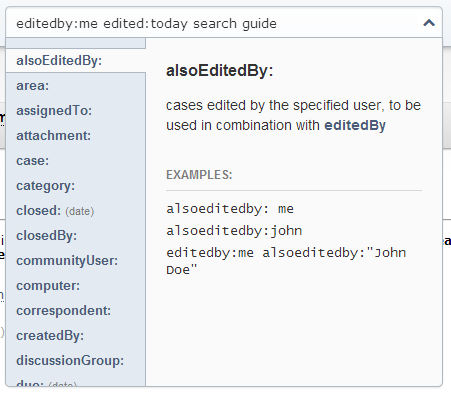 These axes allow you to build searches to find particular cases or any cases matching pretty much arbitrary criteria. These are documented here. To help find the axis you are looking for we’ve added a guide to the search box. This is available for customers using FogBugz On Demand with FogBugz Ocelot enabled. Clicking each search axis on the left will provide a brief description and examples.